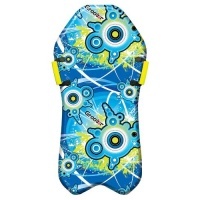 These are some of our favorite toys to play with in the park or out and about. These are great fun where ever and when ever. 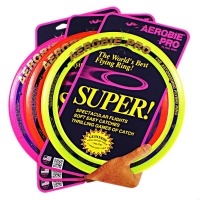 The Aerobie Pro Ring is the world record holder ring. This flys further than every other ring or frisbee. 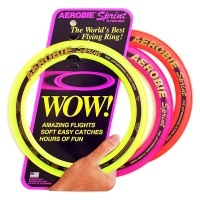 The Aerobie Sprint Ring is the smaller version of the Pro Ring but that does not mean it is any less. It does not fly quite as far but that means you don't need to walk as far to get it! 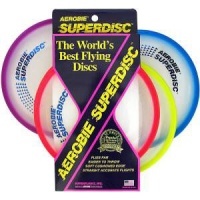 The Aerobie Super Disc is Aerobie's answer to the frisbee it has a soft rubber edge with a special spoiler profile for long accurate flights. 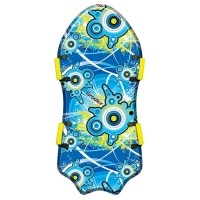 The Groover 43in 107cm long sledge is bigger than the buddies for older children and young at heart adults! Super Fast and great control using the Groove tech to stay straight. The Groover 47in 120cm long sledge is great for adults and can fit two children on board with two sets of handles. Super Fast and great control! 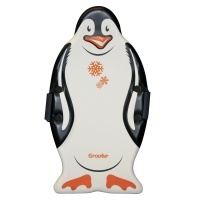 Groover Sledge Buddy Penguin 36in is a special 3D version just for Children. With the groove tech for keeping straight and fast. Race downhill on a Penguin how cool! 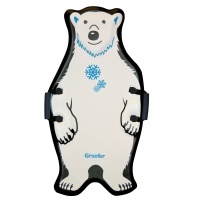 Groover Sledge Buddy Polar Bear 36in goes straight and fast with groove tech and is a special version just for Children. Ride down the slope on a Polar Bear awesome! 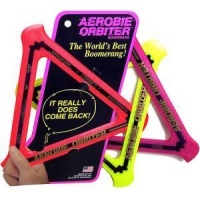 The Aerobie Orbitor is the Aerobie Boomerang. This takes a bit of practice but flys about 90ft and then comes back round to you.